A method of starting a session in a synchronization system. The maximum size of a message that is to be sent from a synchronization server to a mobile station for the request, and coding instructions, by which at least one of the identifiers can be coded into a bit sequence requiring substantially fewer bits than its ASCII presentation, are determined in the synchronization server. Decoding instructions, by means of which the original identifier is obtained from the bit sequence, are determined in the mobile station. When the purpose is to transmit a request indicating the need for starting a session to at least one mobile station, a message is formed, is shorter or as long as said maximum size and comprises the pre-selected identifiers, at least one of which is presented as a bit sequence defined according to the coding instructions. The mobile station forms a session initialization message on the basis of the information included in the message received from the server, at least part of information being defined from the received bit sequence according to said decoding instructions. The solution according to the invention provides the advantage that on the request of the server, a session can also be started in devices that do not support the reception of concatenated messages. When a message transport service, such as SMS, provided by the mobile network can be used, a message can always be delivered to its destination (when the device is switched on) also in devices which do not allow push services activated by the network. The solution of the invention also helps to avoid problems which result from the packet-switched network possibly delivering messages to the client in an order differing from the order in which the server has transmitted them, or some messages possibly even getting lost. In addition, as the transmission of a request requires less space, data transmission resources can also be saved and as a result, there are fewer costs. This saving can be very significant in cases where the server has to transmit a request to a large number of client devices. FIG. 6 is a signaling diagram of a management session according to a preferred embodiment of the invention. FIG. 3 a illustrates a networked system in which data of databases can be synchronized between synchronization servers S and mobile stations MS. In the synchronization, the MS can act as a client device and thus comprise a database to be synchronized. The server S can serve several client devices MS. It is also possible that the mobile station acts as a server for another device. The MS communicates with the server S through a mobile network MNW (Mobile Network). It is also possible that the S is implemented in the mobile network MNW. The client device MS, which has been attached to the network MNW, comprises a mobile station functionality to communicate with the network MNW wirelessly. Instead of a conventional mobile station, the MS may also be any electronic device comprising a messaging functionality, such as a portable computer or a PDA device, or alternatively, for instance, an auxiliary device of these devices, which is arranged in connection with its host device by means of its messaging functionality so that a short-range radio link, for instance, is used. In this case, the host device should be capable of concluding on the basis of part of information coded into the message that the message is intended for the auxiliary device. The mobile network MNW comprises at least a block MB providing a message service. Between the mobile network MNW and the server S there may also be other networks, such as a local area network LAN. The mobile network MNW may be any known wireless network, such as a network supporting a GSM service, a network supporting a GPRS service (General Packet Radio Service), a third generation mobile network, such as a UMTS network (Universal Mobile Telecommunications System), a wireless local area network WLAN or a private network. If the MNW is a GSM network, the block MB providing a message service comprises at least a short message service center SMSC. An important transport layer service in several mobile networks is WAP, which comprises a WSP layer (Wireless Session Protocol), which can be used for providing a transport service for the synchronization application layer in the client device MS and in the server S. The WAP supports several lower level transmission technologies, such as a SMS-based transmission. Also HTTP or OBEX standards, for instance, and lower layer transmission technologies supported by them can be used. The server S itself may comprise a database it has synchronized, or the database synchronized by it can be located in another device, in FIG. 3 a servers S and databases DB are separated for the sake of clarity. As illustrated in FIG. 3 b, mobile stations MS and servers S comprise memory MEM; SMEM, a user interface UI; SUI, I/O means I/O; SI/O for arranging data transmission, and a central processing unit CPU; SCPU comprising one or more processors. The memory MEM; SMEM has a non-volatile part for storing applications controlling the central processing unit CPU; SCPU and other data to be maintained, and a volatile part to be used for temporary data processing. Application data, which is the object of the synchronization, is maintained in the memory MEM of the MS (which is, in the example, a database to be synchronized for the synchronization) and in the memory of the databases DB. FIG. 4 illustrates a method according to a preferred embodiment of the invention. Information on the identifiers required for a request indicating the need for starting a session (for synchronizing user data or for device management) is set  401 in the synchronization server. These include at least the identifier of a synchronization server, the identifier of a synchronization protocol version supported by the synchronization server and the identifier of the requested synchronization session. Coding instructions and the maximum size for the messages that are sent to indicate the need for starting a session are determined 402 in the synchronization server S. The maximum size can be determined according to the used message transmission service, e.g. according to the maximum size for a text message in the SMS service. The determination can be performed such that a numerical value for the maximum size is directly set to the device, for instance, or the device is arranged to place the fields in such places in the message that the length of the message will be within this maximum size. The maximum size can also be determined by inquiring the network of this information or it can be delivered to the device in the management session, for example. The user may also enter the maximum size. The message system of the device is at least arranged to notify the application forming the message when the message size is too large. Decoding instructions are determined 402 in the mobile station MS acting as a client device. By using the coding instructions, the S can code at least one of the identifiers to be transmitted into a bit sequence requiring substantially fewer bits than the ASCII presentation or WBXML binary presentation of the identifier. By using the coding instructions, the client device, for its part, can define the original identifier from the bit sequence. When a request indicating the need for starting a session needs to be transmitted  403 from a server to at least one client device, the server S defines 404, according to the coding instructions, at least one bit sequence for at least part of information required in the message. The message requires at least the identifiers mentioned below, but typically it also includes other information. The information to be transmitted is formed 405 into one message. The server S also controls 405 that the message does not exceed the defined maximum size. If the message seems to exceed the maximum size, the server S may delete less important fields from it and/or, by using the coding instructions, code more information into a form which requires less space. The message is transmitted 406 from the server S to the client device MS by using the message transmission service of the network MNW. According to an embodiment, an SMS service known to a person skilled in the art can be used for transmitting the message. In the client device MS, the information according to the bit sequences in the received message is defined 407 for the initialization message by using the coding instructions stored in the client device. 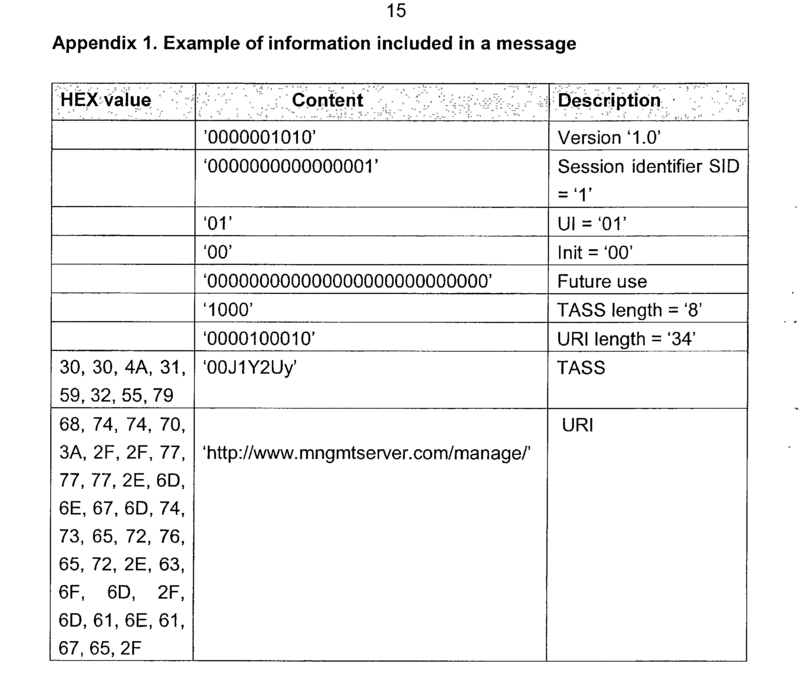 Based on at least one identifier obtained in this way and other information included in the message, the MS forms 408 a session initialization message and transmits 409 it to the synchronization server S.
FIG. 5 illustrates possible elements of a message formed ( 405) in order to start a device management session. According to a preferred embodiment, a push service of the WSP protocol is applied by using SMS messages, whereby the message comprises a WSP header field. The WSP header field must be short enough (preferably less than 30 bytes) so that there is enough space for the payload intended for the actual application level (CA) processing the message. It is to be noted that in addition to the WSP field, the message may also comprise other header fields, such as WDP header fields. In this case, however, the proportion of the SyncML payload decreases. According to an embodiment, the message may also provide an indication of the application to which the content of the message should be addressed. On the basis of the indication, the MS can direct the payload of the message to the right application entity, e.g. a request for starting a management session to a client agent CA. The indication may be included in the WSP or WDP header field of the message. A device supporting the WAP protocol easily recognizes the information from the message, but a non-WAP device has to be provided with a predetermined location, from which the indication of the application has to be retrieved. This location can be determined by using a predetermined location from the beginning of the message (offset) or such that the indication always occurs after a certain character in the header field. For example, in the WSP header field the indication may be in the identifier ‘Application—ID’ (x-wap-application-id), the MIME field can also be utilized instead of the ‘Application ID’ field or to specify the information of the ‘Application ID’ field. Version (VER). Contains the message version to be used and thus also the protocol version so that the client device can check whether the server S supports the same version. The version identifier may alternatively indicate only the message version or the protocol version. The client device need not start ( 408, 409) the session if it supports a different version. The version identifier can be coded according to the coding instructions set in the server S into a shorter bit sequence, for instance such that the first 10 bits after the WSP header field are used: the last number refers to the smallest version numbers, the second last refers to ones, the third last refers to tens and the fourth last refers to hundreds, in which case the largest possible version is ‘102.3’ and the version ‘1.0’ is coded into a bit sequence ‘0000001010’. As stated earlier, the MS comprises decoding instructions for determining (407) the original identifier from the bit sequence. Future Use of the Device Management (Fut). In the field, possible information which is to be defined later can be transferred from the server S to the client device MS for the management session. For instance, 30 bits of space can be reserved. One possible example of information to be transferred in this field is a moment at which the client device should establish a session to the synchronization server S. The MS can transmit the initialization message ( 409) at the time set by the server, and the server S may, for instance, balance its load by setting the different client devices to set up a connection at different times. FIG. 6 shows a signaling diagram of a device management session, which is started on the request of the synchronization server (S). When the server and the client device (MS) can communicate  601 (at least so that the MS is capable of receiving messages, also the steps 401 to 402 of FIG. 4 have been performed), the server receives 602 a command to start a management session from the server user, from outside the server or on the basis of a predetermined setting. In response, the server collects the necessary data, carries out the changes according to the coding instructions and transmits 603 a message according to the request [Package #0:Management Alert to Client] to the client device. Based on this, the client device and the server can establish a management session 604. The server S can transmit management commands to the client device, and the client device alters its configuration on the basis of these management commands. After the management session is completed 605, the result can be presented 606 for the server user. The session can be used to synchronize conventional user data, e.g. to update calendar markings of the mobile station and the calendar application of the network. In this case, an initiative to start the synchronization ( 403) can take place, for instance, when a new important calendar marking, which needs to be delivered in the mobile station as soon as possible, is added to the network calendar. Like the message formed for the device management session and illustrated in FIG. 4, the message that is formed in order to request a SyncML session comprises several corresponding fields. At least fields marked with a star Version (VER*), Session Identifier (SID*), Source and URI of the Management Server (URI*) are also required in the message to be formed for the request for starting the synchronization. Information of at least the fields (UI), (VER*) and (Init) can be converted into a short bit sequence in the manner described above. The message may also include information on the synchronization session the server requires. Such information includes, particularly, an indication of the synchronization type required by the server S (e.g. Two-way, One way sync from server only, One way from client only, Refresh Sync from server only). This information can also be coded (404) and decoded (407) by utilizing a prestored (402) correspondence table, whereby the number of required bits can be saved. It may also be useful to transmit the identifier (URI) of the database (which the server needs to synchronize) in the message. After the SyncML client device MS receives the message, it may transmit (409) a synchronization session initialization packet (Sync Initialization Package from Client) according to the information included in the message, and the synchronization session can be initialized. For a more specific description of the synchronization session of the SyncML protocol and the information required for it, the SyncML specification “SyncML Sync Protocol, version 1.0.1”, May 2001, is incorporated in the application as a reference. Thus, the same advantages can be achieved when both a management session and a user data synchronization session are started on the request of the synchronization server. It is also possible that said message is formed  405 somewhere else than in the server S which transmits the request. A situation like this may occur, for instance, when a client device communicates with a WAP gateway by means of a WAP stack, and an HTTP protocol is used between the WAP gateway and the server S. The WAP gateway, for instance, can then condense the request transmitted by the server in a manner described above (by using coding instructions) so that it can be transmitted in one message to the client device MS.
transmitting the session initialization message from the client device to the synchronization server. a transport layer service in the synchronization system is configured by using a WAP protocol, whereby the message further comprises WSP header fields (Wireless Session Protocol). the content of the message is directed in the client device to the application denoted by the message. the message transmission service is SMS. the identifier of the synchronization server is determined in the field containing a shared secret. the synchronization server is also configured to determine a bit sequence in the message, indicating whether the client or the server has caused the message. the coding instructions and the decoding instructions comprise one or more correspondence tables. the session is initialized for synchronizing a data set included in the client device and at least one database. the management session is initialized between the server and the client device. the client device is configured to transmit the session initialization message to the synchronization server. which synchronization server is configured to transmit the message to at least one client device by utilizing the message transmission service. means for altering the configuration of said device according to management commands received from the device management server during the device management session. transmit the message to at least one client device by utilizing the message transmission service. means for altering the configuration of the device according to management commands received from the device management server during the device management session. ES02767509T ES2368211T3 (en) 2001-10-09 2002-10-08 A synchronization procedure initiated by server in a synchronization system where the request message server has a maximum size.